Posted February 17, 2010 by Emmet Farrell in Features. 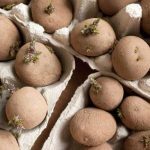 Growing your very own potatoes is both simple and very rewarding; Potatoes come in a wide choice of varieties and flavours with something to suit all tastes. 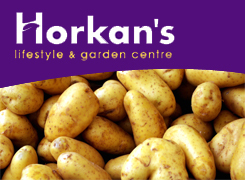 Horkans range of Seed potatoes has been carefully selected to suit the growing conditions in the west of Ireland and to ensure the best varieties for flavour and yield. 1. First Early varieties – first to crop, ready in June/July. Great new Potato flavour. 2. Second early varieties – ready in July/August, heavy yields. Super flavours. 3. Main crop varieties – September to December, great croppers, super flavours. Some of the best varieties we recommend you grow this spring include the first early varieties including Red Duke of York, a lovely red skinned variety, large cropper, super flavour. Sharps Express are a wonderful new potato flavour, great to grow in pots, good cropper. Orla is an Irish variety, good blight resistance, lovely flavour, good cropper. For two wonderful second early varieties we recommend you grow British Queens, a floury potato,wonderful cropper, super flavour and Records, yellow dry flesh, floury, good cropper. For your main crop selection try some of the blight resistant varieties including Sapro Mira, a red skinned, big cropper with great flavour. Sapro Axona, a heavy cropper, great size, wonderful flavour. Remember you can grow potatoes in our special potato bags and pots. We recommend you plant up to four potato tubers using Westland Organic Compost. Simply place outdoors on a patio or sunny location, add water and enjoy great tasting home grown early potatoes from your own Garden. Horky’s Tip: Feed your Potatoes with ONE LIQUID FERTILISER every fortnight for a bumper crop. 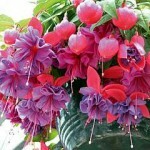 February – Tips For Your Garden.